Photo by Indiana Thompson. Ms. 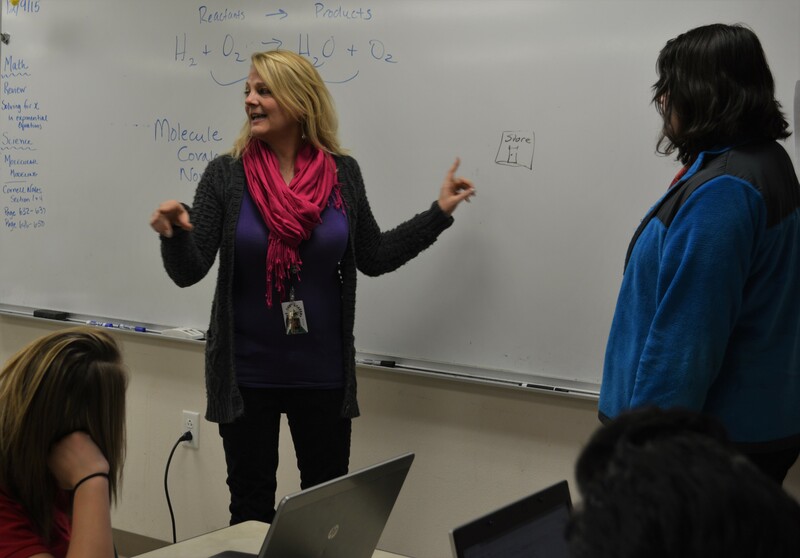 Pink, February Manager of the Month, teaches her biomedical science class. Ms. Pink, a project manager at ASK, is passionate and caring and loves to work with scholars and thrives on mentoring scholars in and out of the classroom. She uses humor to connect with her students, along with an open and non judgmental ear. What drove you to become a teacher? A lot of my children’s teachers encouraged me to become an educator. I would volunteer in their classrooms and always make the activities or snacks relate to the content. How did you get your start in teaching? I was home for 10 years working with my own kids. Yes, I am an ex-homeschooler. My children also attended an APS Family School where the curriculum was project based and allowed children to explore their interests. I loved the challenge and the new shift in education. I then enrolled in a program that taught educators in the same way. Teaching also offered a schedule where I could continue being involved in my children’s lives. I have had a blast in education ever since, and I’m lucky enough to work with some of the best people and scholars. What made you want to choose to teach history? HISTORY IS COOL! History is the backbone to all academic areas! History teaches reading, writing, science, politics, philosophy (should I bore you with more reasons?) History allows you an opportunity to understand how to better approach problems that you will face in all areas of your life, community and world! History is inspiring, that is why I teach history. What struggles do you have throughout the day? Wanting more time to work with scholars on assignments or tutoring. What are some things you would change in the school? Do you love your scholars? Yes, you can say that I love working, sharing, and talking to my scholars. Do you get along with other managers? We have an excellent staff; how could I not get along with them? They are wonderful! Is there any particular time in teaching you can’t stop talking about? Let’s just say recently we had an incident with Wikipedia in New Mexico History. Teaching has something every day that makes my list of “GREAT TEACHING MOMENTS,” although at times it is not what I am instructing but what I learn from the scholars..
What is something scholars might not know about you? Hmmmmmm? Back in the day I received special services and I was fortunate enough to work with great teachers who had exceptionally high expectations. I didn’t read well until 5th grade and I work on being a better writer every day. I am a volunteer for the Rio Grande Nature Center, where I work the front desk two weekends a month. I enjoy being at home and going for walks with my dog, reading a great book and having dinner with my kids. Track and Field is my favorite sport but I really like watching basketball. No, I do not have a favorite team. I ran in circles really fast and it paid for college. I was a sprinter and middle distance runner. I was a Unicorn! Really; it was our mascot at our school. I describe myself as uncomfortably popular. I was in drama, speech, yearbook and sports. Never sought out a certain group or felt like I had to hang out with certain people. Do you see yourself in the scholars at ASK? Yes, I feel that as a population the scholars at ASK are very accepting of each other and for the most part very considerate. Hidden somewhere else besides ASK? Yes, I have one that is a junior at ASK that I am very proud of but will not reveal his name. I also have a grown daughter that attends CNM and has a full-time job as a manager of a department at Albertson’s Grocery stores. If you had Friday evenings off and money was not an issue, what would you do? I like how you say “Fridays evenings off.” I would love to meet and treat my friends (which include Project Managers at ASK) at “Farm and Table” for dinner! Then go to a play at Popejoy Hall.